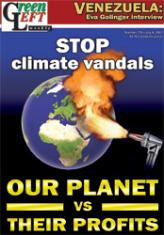 From Green Left Weekly, 29 June 2007Two of the world’s worst climate vandals — US President George Bush and PM John Howard — are preparing their lofty green rhetoric in the lead-up to the so-called “climate change” Asia Pacific Economic Cooperation (APEC) summit in Sydney in September. With a federal election looming, the Coalition is still trying to convince us that its refusal to sign the Kyoto Protocol and its support for the coal and uranium industries don’t mean it doesn’t care about the future of the planet. The recent announcement that he’d consider an emissions trading scheme hasn’t shifted the Howard sceptics. Bush is also under pressure for his head-in-the-sand approach on global warming. Leading the charge for a European-style carbon trading regime is Californian governor Arnold Schwarznegger who, last September, signed into law the Global Warming Solutions Act that mandates a 25% cut in the state’s emissions over the next 20 years. Internationally, the US is increasingly feeling the pressure over its anti-Kyoto policy. At the June G8 summit in Germany, Bush announced that the US would “seriously consider” adopting emission reduction targets of 50% below 1990 levels by 2050. Bush and Howard plan to use the APEC summit to carry out more of their greenwashing: they want to “forge a new international agreement” without mandatory targets and, as APEC cannot impose binding commitments, any new agreement would be based on a voluntary “pledge and review” system. The new agreement would be modelled on the Asia Pacific Partnership on Clean Development (AP6), which met for the first time in Sydney in January 2006, where the six countries involved — the US, Australia, Japan, South Korea, China and India — set no emission reduction targets and reaffirmed the centrality of fossil fuels. The June 19 Sydney Morning Herald revealed that of the $100 million the Howard government pledged towards joint AP6 “clean energy” projects — including the development of so-called “clean coal” technology as well as nuclear energy — so far only $2 million has been spent. Similarly the US (the only other country funding AP6 projects), has spent just US$1 million of a promised $52 million. The AP6 meeting that was to be held in India has now been indefinitely postponed. Bush has plans to meet with leaders from 10 to 15 of the world’s biggest polluting countries directly after APEC to establish “general principles” (read: no binding emissions targets) for a post-2012 climate change framework. Washington, with Canberra’s collusion, is attempting to create a bloc that could act as a counterweight to the European Union and Third World countries that will be demanding greater commitments during the December Kyoto negotiations in Bali. The climate vandals’ approach is to stall, for as long as possible, measures that would cut into the profits of US- and Australian-based fossil fuel corporations. The US is home to three of the world’s six oil supermajors — ExxonMobil, Chevron Texaco and ConocoPhillips. ExxonMobil is the largest publicly traded company in the world, raking in $39.5 billion in profits in 2006. Earlier this year, the Union of Concerned Scientists released a report that noted that “ExxonMobil has funnelled nearly US$16 million between 1998 and 2005 to a network of 43 advocacy organizations that seek to confuse the public on global warming science”. Howard is seeking to minimise any loss in profits to Australia’s emission intensive companies, in particular the coal industry which is worth A$22 billion annually. BHP Billiton, the world’s largest mining company and Australia’s largest coal exporter, recorded a record $13.7 billion profit in 2006. The APEC meeting is likely to affirm the decisions made by the APEC energy ministers’ summit in Darwin in late May that reaffirmed the central role of fossil fuels in their energy mix. The unproven “clean coal” and nuclear power options were projected as energy sources to help reduce emissions. But the need to secure the remaining scarce oil supplies was the dominant theme of the Darwin meeting. By 2030, it is expected that APEC countries, inhabited by 41% of the world’s population, will rely on imported oil for 52% of their overall supplies, up from 26% in 2002. This makes them vulnerable to supply disruptions and high oil prices, something that sends shivers down the spines of the US oil corporations and their political masters in the rich countries. The big US oil corporations are also worried about a handful of governments, such as Russia and Venezuela, that are aggressively asserting their right to give state-owned companies access to oil and gas supplies. An APEC working group investigating how to cooperate with state-owned companies will report to the September summit. Washington will also want to use the forum to further develop a network of biofuel producers in the Asia-Pacific region. Biofuel production is the cause of massive deforestation in APEC member countries such as Malaysia, Indonesia and Thailand. Nevertheless, the US wants the biofuel network extended throughout Latin America to displace 20% of petrol use by 2020. The business-as-usual approach by the rich countries will mean that the poorest APEC member countries will suffer the most from global warming and climate change. For instance, we can be sure that this APEC meeting will do nothing good for the 2000 people living on the Cataret atolls, part of Papua New Guinea, who will have to be evacuated when rising seas inundate the small islands. Indonesia and Climate Change: Current Status and Policies, a World Bank report launched on June 4, concluded that global warming could threaten Indonesia’s food security, as rising sea levels flood coastal farming areas, with up to 2000 islands at risk of being submerged by 2030. Changing weather patterns would also lower rice yields. Expanded biofuel production in Indonesia would also exacerbate deforestation and the burning of forests and peat lands, which have already resulted in the country being included as one of the world’s top greenhouse gas emitters. Other poor APEC countries such as Thailand, Vietnam, Philippines, Mexico and Peru are also more vulnerable to the effects of global warming, having less infrastructure and economic capacity to buffer its adverse impact. These countries will hardly have a say at APEC, let alone benefit from any of the decisions made by the climate vandals. That’s another reason to join the protests against Bush and Howard at APEC in Sydney on September 8.